" The same is probably inevitable in Shogi and Go in the future." Maybe in shogi computer is already as strong as a top professional. But in Go as long as I know it's only around 5d KGS level. I don't believe that in my lifetime there will be a computer able to defeat top pro. 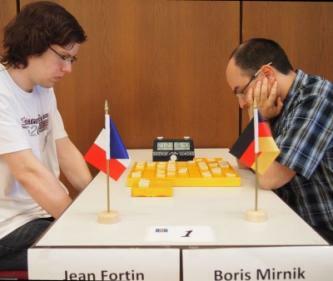 @PeterCook: Besides playing Shogi (and Chess) Jean also plays Go. We already said that he plays on KGS as 'racine'. As we have previously explained, we thought that it would be of interest to the Go Community to get the insight of the best European Shogi player on other board games. What the heck does this have to do with KGS? LOL ! Just a small remark. The Japanese shogi association did not prohibit players from challenging computer shogi programs, but took this process under its control in order not to lose the economic benefits. There are fees for the participation of one or another pro player in such event. Since "the ban" imposed in 2005, several human vs computer fights have already taken place. The next event will be held in January 2012, the computer will challenge the head of the association 67-year-old ex-Meijin Kunio Yonenaga. This match will cost organizers ? ?10 million (considered to be relatively low-priced). For the record, the delay was my fault, and I apologize. I should also explain that some (very few) questions were not included in order to avoid redundant responses. We want to thank Mr. Jean Fortin for the time and effort he has put in for the interview. We hope you enjoy it!